The tragic events of recent weeks across the globe have once again fuelled the problematic rhetoric of values, be they British or Western, rendered simple a grasp of what extremism is and intensified the debate about the role of education in engaging with these issues. In this context we are drawing your attention to a number of questioning blogs, which have seen the light in the last few months. The first two of these are the work of Gus John, the prominent educationalist and activist, whose roots in youth work go back to the late 1960’s. Although the first, Patriotism in Black and White, refers to the Rochester tweet of Emily Thornbeer, it retains all its pertinence. Particularly, given the coming election, it challenges the Labour Party’s understanding of class. What Ed Miliband should understand is that his view of Labour’s traditional heartland, the working class, does not consist of whites only, with or without white vans. Even as he seeks to placate the white working class, the British African and Asian working class could justifiably resent his failure to acknowledge that they experience painfully the flags which the Far Right elements of that patriotic section of Labour’s supporters have a right to fly. In the hands of that section of the white working class, the Union Flag and the St George’s flag have replaced the famous black shirts and brown shirts that once represented the ugliest face of the ‘Keep Britain White’ and Christian brigade. The danger in the Labour Party allowing UKIP to set the agenda on immigration and then running around to woo the electorate away from them is that Miliband and his Party get engulfed in the same racist discourse and end up projecting a ‘white Britain’ mindset. In the second, After Trojan Horse : Ofsted on the gallop, in a sweeping and incisive critique he exposes the bankruptcy of Ofsted and the dangers inherent in the ‘Prevent’ agenda, not only for teachers, but for all educators. The fact remains that that protection of our nation that the government seeks to guarantee through its ‘prevent’ and safeguarding agenda is not afforded to all citizens and some citizens are not placed under surveillance or made subject to indiscriminate police stops and searches on account of the ‘terror’ they unleash upon sections of their own community. They therefore feel emboldened to sow fear, cause mayhem and engage in racist attacks and (sometimes) murders, while proudly and defiantly carrying the Union and St George’s Flags, in the full knowledge that the police and the state have never seen their predecessors, including the National Front, Column 88 and the BNP as ‘terrorists’, or as a threat to the nation and its security. As an educator, I consider these legitimate matters for building and delivering curriculum, in order, especially, to encourage school (and college) students of all ethnicities to examine what this means for them all as they forge an identity as young British people, what the role of schooling and education should be in relation to it all and how they can work together to make sure that they, collectively, are building a future with the hallmark of racial justice and human rights, rather than one of chaos, racial conflict and the lack of a guarantee of state protection for all citizens. 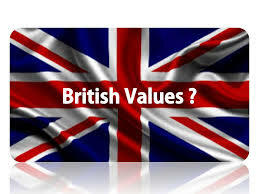 In ‘Charlie Hebdo,Ofsted and British Values: time to pause for thought’ Graeme Tiffany, Vice-Chair of the Federation for Detached Youth Work, expresses similar concerns, arguing that engaging with the meaning of values demands process not instruction. He quotes Jacqueline Baxter’s concern about ‘new values police’. Finally, in Exploring Extremism, Elizabeth Harding of the North-West Regional Youth Work Unit worries about the extent to which youth workers are responding to the dilemmas posed by the ‘Prevent’ agenda and the notion of ‘British’ values. More than ever, young people need the opportunity to explore ideas, to learn about each other and to be challenged, and supported, to question. The world’s changed so much in those intervening five years; not least the infrastructure of youth services. It’s shrunk and is disappearing. Who’s providing the challenge, who’s bringing young people together to learn about each other’s cultures and religions? I do hope someone will let me know that there IS great work going on out there. I suspect there is, but there’s no co-ordination and no learning from each other. Previous On Elections, Young People and the Future : The Greek Alternative? A Few Days Away? Can Emily Thornbeer support her statement that there is no intelligence gathering, surveillance or police stop and searches of the far right with her evidence please ?